I would like to start the development of some basic Arduino projects but I don't own an Arduino board yet. Is there a way I can write my code and emulate/test it using a desktop computer so after my board arrives I just have to upload and run my project on it? There are a whole slew of Arduino simulators out there, many free, and some paid products as well. The CodeBlocks Arduino development environment includes a free Arduino simulator, still under development but functional. Simuino simulates the Arduino Uno and Mega pins - not a pretty-looking realistic simulator, but it works. Many other Arduino simulators are out there if you search, and new ones are being announced, even crowdfunded, all the time. I like to use circuits.io aka TinkerCAD for this. It's cloud based and has some nice features including PCB design and collaboration. IMO the Arduino simulation and capability is impressive and intuitive. Plenty of options exist in the world of electronics simulators, but circuits.io aka TinkerCAD is probably the most versatile one out there. You can compose your circuit on a virtual breadboard which looks just like real. You can actually watch a LED blinking or press a button during real-time simulation rather than struggling with abstract waveforms. You can combine digital devices like a 555 timer or shift registers with (interactive) analog components like resistors and LEDs. You can program an Arduino and simulate the microcontroller together with your analog circuit around it. You can debug an Arduino: when the simulator reaches your breakpoint, the simulation is paused and you can easily check every variable in your code and every voltage or current in your circuit. You can use and observe different communication protocols like UART, I2C and SPI. This is an example circuit that has with an IR Remote and an LCD Screen. You can use Yenka (free for home use) to simulate Arduino, PIX, PIXACE and other boards with digital, analog and serial I/O. It provides a lot of components and sample projects. Interrupt handlers taking 10 µS to process an interrupt when only 9 µS is available. By their nature simulators can't reproduce all of this. Even if they could, would you think to toggle the "insert random noise from motors" option? As for getting ready for the board to arrive, download the IDE and start programming. You can get libraries installed, code written and free of syntax errors, organize it neatly, and be generally ready for the big day when the hardware is in your hands. Have fun and enjoy experimenting with your Arduino! For full emulation of Arduino, there is a shareware program called VBB (Virtual BreadBoard), I tried it too and it was nice. I believe this website has a list of both emulators and simulators along with their price and availability. Emulino: Is an open source linux based software in early development that emulates Arduino-specific MCUs. Emulare: is a general purpose hardware emulator. It aims to provide a central interface to build electronic simulations for embedded software development. At present emulare focuses on the ATMega line of microcontrollers (Arduino UNO has the ATMega processor). SimAVR: is a new AVR simulator for linux, or any platform that uses avr-gcc. The simulator loads ELF files directly, and there is even a way to specify simulation parameters directly in the emulated code using an .elf section. It supports emulation of many ATMega processors and it is mentioned that it's easy to even add new ones. Amtel Studio: This doesn't seem to mention the term emulation, but it is a sophisticated IDE to debug your code for many platforms specially Arduino. Atmel Studio 7 features seamless one-click import of projects created in the Arduino development environment. Your sketch, including any libraries it references, will be imported into Studio 7 as a C++ project. Once imported, you can leverage the full capabilities of Studio 7 to fine-tune and debug your design. Atmel Studio 7 fully supports the powerful embedded debugger on the Arduino Zero board. For other Arduino boards, shield-adapters that expose debug connectors are available, or switch to one of the many available Xplained-Mini/PRO boards to fully leverage the Atmel HW eco-system. You can still use simulators such as EasyEDA to test your code and in most cases be able to run it on the device. But note that given the nature of electronic components, you may have to provide external resistors, capacitors etc to get the expected results. Virtualbreadboard has a new VBB4Arduino 'Two Arduino's' edition which includes BOTH a JVM Arduino emulator AND a AVR Instruction set simulator with examples that cover almost all of the Arduino distribution examples and a bunch of peripheral hardware - LCD's, WS2812 Neo LEDS, Motors, Servo's, Logic Analyser and more. Try Simulator for Arduino - it is the best but then we are biased since we are part of the development team. Not everyone wants to pay $19.99 although almost 5k Arduino users have in the last few years. There is a free version of Simulator for Arduino which runs for 45 days or 100 sketch loads and 200 lines max. Try this and then buy if you can afford it and/or if it seems worthwhile. 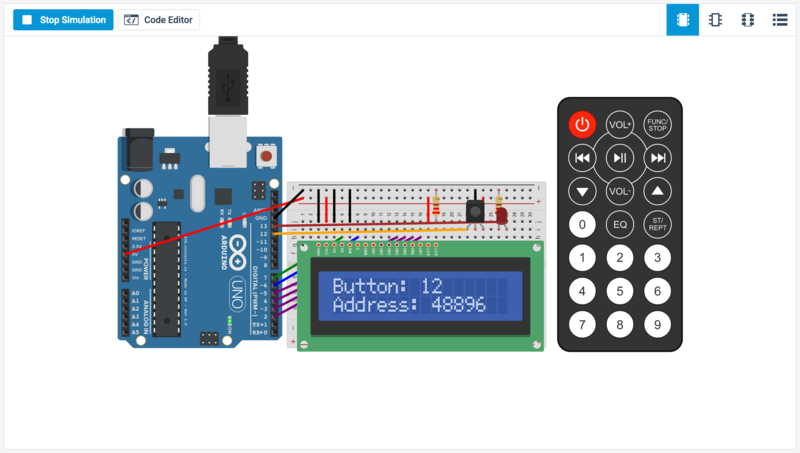 If there is something not right or which could be improved, let us know - everyone else does and has, which is why Simulator for Arduino has been 99% built by user ideas and bug reports. Also, the only other program we have tried which comes close in quality is Proteus but this is a full PCB design studio and looks to be very expensive - ie much more than $20. And we plan to ignore a recent user request to increase the price to $200. You could e.g. use my simulator. It is especially suitable for PLC-like applications, where multitasking is achieved by cyclic evaluation of interconnected circuit-like objects: Timers, Markers, Latches, Oneshots and Registers. You can use it to simulate your controlled system as well, as becomes clear from the examples in the download. It has modest visualisation capacities, can draw timing charts, and allows you to access and alter c.q. 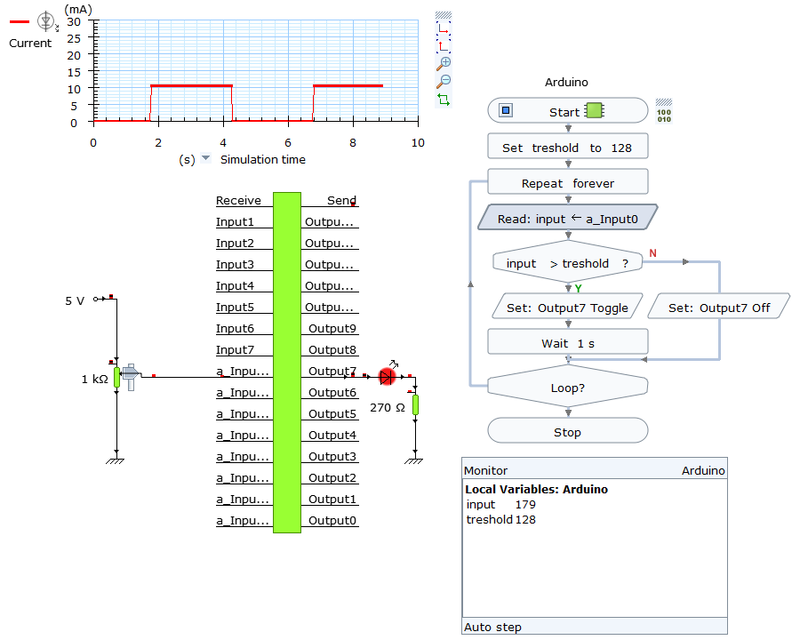 force all variables in real time during a running simulation. Also you can freeze time. When you're satisfied with the behavior of your control it generates the C code to be uploaded to an actual Arduino. If you mean being able to "unit test" using a desktop computer, I can offer a library I wrote called arduino_ci. // pin history is queued in case we want to analyze it later. // we expect 6 values in that queue. // convert history queue into an array so we can verify it. In practice, you would probably not be calling the digitalWrite functions directly -- you'd call a function in your library, then verify that the "world state" (represented here by the GODMODE construct) matches what you expected your library to do. Yes you can, and fairly easily. There is a wonderful online simulation (completely free) called TinkerCAD. It has an excellent breadboard simulation, with parts like transistors, LEDs, ICs, and Arduino. You can program the Arduino and run it all in a live simulation that includes interactive inputs (pushbuttons, DIP switches, etc.). That's not all. It also includes in a separate tab schematics for your circuit, and another tab for PCB design of your breadboard circuit! Or, you can just make your schematics from scratch and make your PCB from there. You can have your circuit designs made and you can buy them. You can do all of this in circuits.io, and you aren't risking messing up your actual Arduino. It also has warning indicators in the simulation (for example, if you didn't use enough resistance on an LED, or an IC). Not the answer you're looking for? Browse other questions tagged emulation testing or ask your own question. What is the best way to unit test my code without controller? Is there an Arduino simulator that runs on Mac OS X? There is any way to simulate an arduino due? How to test Arduino behaviour on Windows? Can I program the Arduino without having an actual board with the able to emulate a COM connection to the computer?